The staff. They’re accommodating and good in speaking english. Luckily when we finally find the place we were accomodated and we rested. The female staffs are very good. Me and my brother have a little jamming with playing the guitar in the sofa area while waiting for the time for us to check out. Employees there girls specially work hard, they are nice and funny you can play pool and kill time! Sweet staff. Good value for money. Great location. The value of money very affordable ,,, very clean and the staff was very accommodating. Good location. The receptionist is very accomodating. He gave us the directions and suggested places where to eat. Friendly receptionist who always provided suggestions on where to visit. Staff is friendly. They offer breakfast. 5 minutes ride going to ben than market. The staff is very nice and helpful. Perfect location. 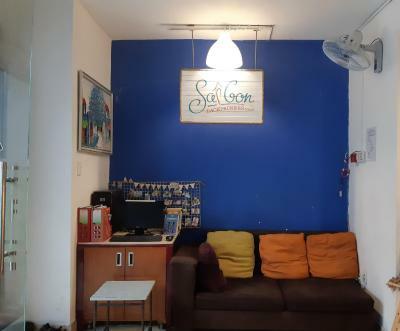 Saigon Backpackers Hostel offers budget accommodations surrounded by the lively shops and restaurants of Pham Ngu Lao Street. 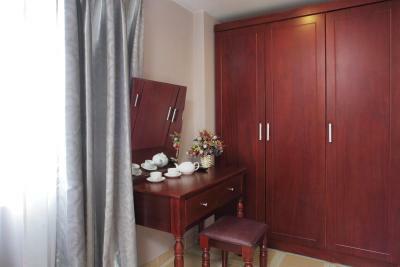 Offering free Wi-Fi and private lockers, it features kitchen facilities and 24-hour reception. 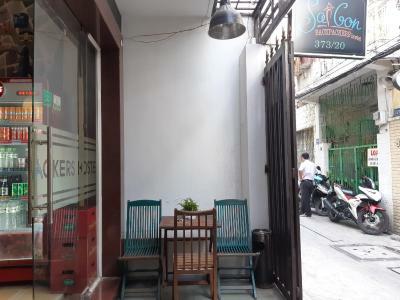 Centrally located in Ho Chi Minh City, Hostel Saigon Backpackers is a 10-minute walk from Ben Thanh Market. It is a 15-minute walk from the beautiful Opera House and Central Post Office. 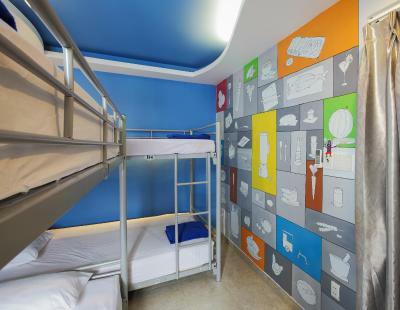 Air-conditioned dorms are fitted with bunk beds and have access to shared bathrooms with 24-hour heated showers. 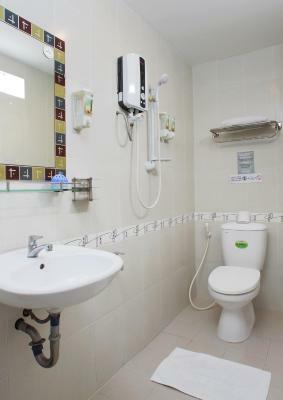 Rooms offer more privacy with a flat-screen TV and private bathroom with a hairdryer. The property offers complimentary guided city tours. Guests can enjoy the use of a TV and DVD player at the common lounge area. Added conveniences include a tour desk, laundry service and daily breakfast. 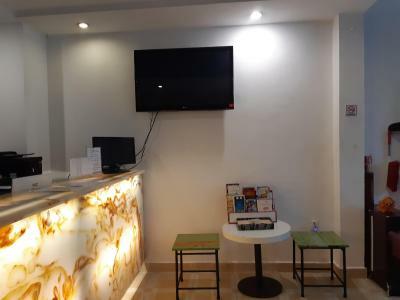 All guests can enjoy complimentary free flow of coffee and tea. District 1 is a great choice for travelers interested in markets, museums and shopping. 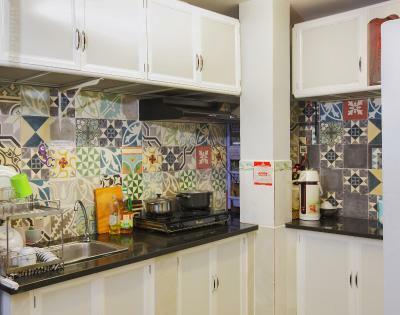 뀐 Located in the real heart of Ho Chi Minh City, this property has an excellent location score of 8.3! 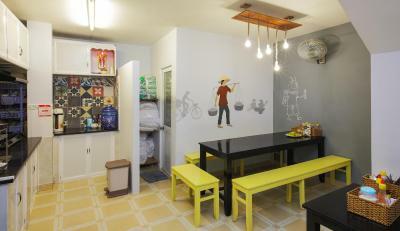 When would you like to stay at Saigon Backpackers Hostel @ Pham Ngu Lao? Offering city views, this spacious private room for 2 guests comes with an private bathroom and flat-screen TV. Opens out to a private balcony with city views. 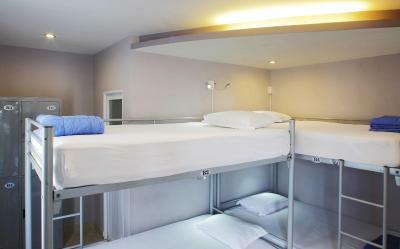 Air-conditioned dormitory room can sleep up to 8 guests in bunk beds. Rate is for 1 guest only. Bathroom facilities are shared. This is a female only dormitory. 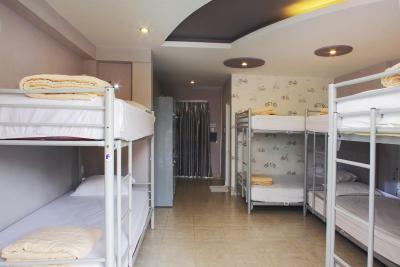 It is air conditioned and can accommodate up to 4 guests in bunk beds. Rate is for 1 guest only. Bathroom facilities are shared. Area Info – This neighborhood is a great choice for travelers interested in markets, museums and shopping – Check location Great location - show map Guests loved walking around the neighborhood! 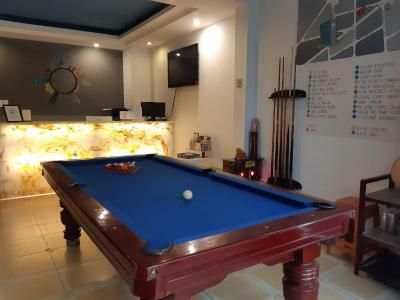 House Rules Saigon Backpackers Hostel @ Pham Ngu Lao takes special requests – add in the next step! 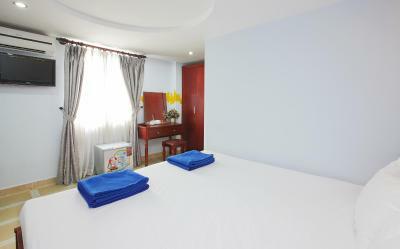 Any additional older children or adults are charged VND 186077.16 per night for extra beds. Saigon Backpackers Hostel @ Pham Ngu Lao accepts these cards and reserves the right to temporarily hold an amount prior to arrival. The room has abit of a weird smell and there wasn't enough soap. The staff were friendly and the location was awesome. Breakfast was prepared by this pretty lady too. In ten weeks in SE Asia this is the first time I'm recommending that you AVOID a hotel. First off, they have 2 locations, and the website directed me to the wrong one. Next, the AC, TV, and fridge were not working in my room, there was no towel, and the soap and shampoo dispensers were empty. To top if off, they turn off power to the ACs for several hours a day to save money. 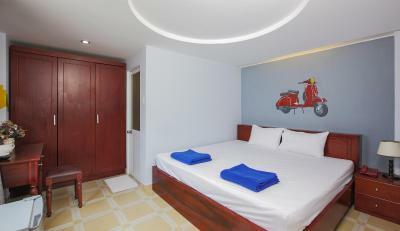 Maybe this would be expected in a budget hotel, but this place is in the midprice range. Staff was not very friendly. Room was dirty with no bedsheets or towels and floor not clean. 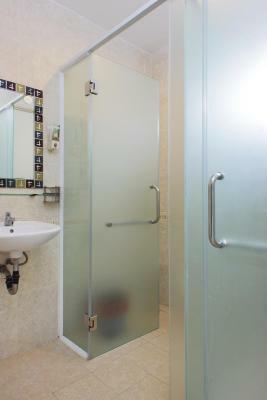 Toilet has one of those shower in the toilet and you make everything wet. Breakfast is a bit sad but coffee is good. They close the door at 2am in case you want to party. Location is great, and there are lots of restaurants and shops around. It's cheap but I am sure you can find better quality. They have a pool table at the reception. They tolled me that its a only women dorms, but most of the people in the room was man..
Nice staff, great location next to the walking street but in a quiet area. Good value for the price! It was almost impossible to lock the door, no bedsheet (cover) on the blanket. We stayed for 3 days - no cleaning, but when we asked, they gave us fresh towels. 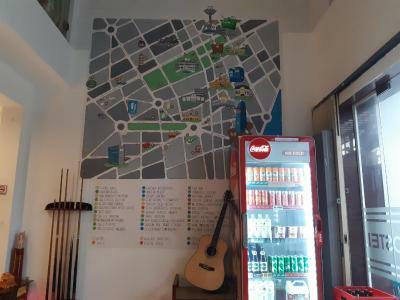 It is located in a street full of backpacker hostels. Private rooms are really simple, but have a working fridge. There is a pool table in the lobby and the beverages are pretty cheap. Breakfast is ok. Most of the staff are nice, but the woman who works on reception rolled her eyes at me when I asked if she could direct the bike driver. I was made to change rooms three times in as many days. Staff kept asking for payment when I'd agreed to pay by card upon departure. Staff would not try and resovle an issue with another guest who was breaking the hostel's rules. The beds, Wi-fi and AC. The rooms was dirty and so was the sheets in the bed. No toiletpaper, and the sink was cloged and the tap was leeking so the bathroom got flooded. The staff wasn't rude it anything.. they just didn't seem to care to much. The location was good. Close to the bus station, and alot of nice places to be just a few minutes walk from there.